Freshman Diane Gaughan’s black hair is streaked with red – the color commonly associated with passion. Just two years after first picking up a camera, Gaughan now rubs elbows with Wilhelmina Models – the modeling agency that practically dominates the fashion world. She shoots for labels, such as Mercura NY, the maker of ornate sunglasses spotted on everyone from Taylor Swift to Elton John. 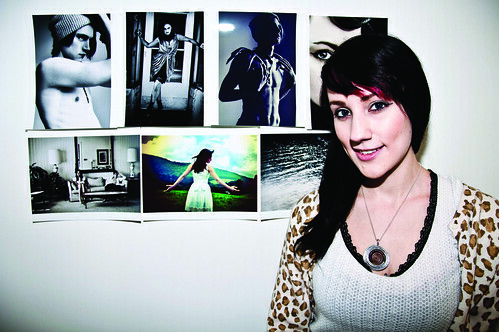 She has an exhibit in the works at Old City’s Studio Christiansen, and she’s never taken a photography class. Want to know her secret to skipping the starving artist part of the art world? Gaughan let The Temple News in on how to get images published, build networking webs that would make a spider jealous and deal with a photographer’s worst nightmare: missing models. The Temple News: What made you get into photography? Diane Gaughan: I was on [https://deviantart.com.] It’s an art community, and I started following this photographer who was about a year older than me at the time – her name was Lara Jade. Her photos were so beautiful, and I was like “Wow, this is something I really want to dedicate myself to.” So, I bought my first camera and started from there. TTN: Tell me more about how you broke into the photography scene. DG: Well, I started in Scranton, [Pa.,] my hometown. I started with my friends, and eventually it caught on. I started entering photo contests, and I would do really well in those. When I came here for school I started working through friends again that I had met here, and then I was looking on Google just for anything Philly fashion to get a gist of what to do. Philly Fashion Week came up. I clicked on it, and there was an application for press. I didn’t think I was going to get in, but I thought “What the hell? The worst they can say is ‘No.’” So I applied and got in. That’s where I ended up meeting Wilhelmina and the models. It kind of all went from there. The models have helped me out tremendously with getting the word out. It’s because of them that designers like my stuff. TTN: How did you end up shooting Professor Jason Schossler’s author image for his book? DG: He was my English 802 teacher, and I had written a paper on fashion photography. I think I included my website at the bottom, and he ended up going on it and liking what I did, so he hired me for the job. TTN: What’s been your favorite shoot so far? DG: I’d have to say [it was] for Mecura NY sunglasses. That was a lot of fun. We just got to play with the glasses. It was a stressful day, though. The models didn’t show up. They were getting paid, too. We had the whole studio set up and about an hour after they were about to show up we figured they weren’t coming. One model actually said, “Oh, I forgot it was my wedding day.” I kid you not. Luckily, I had a friend in New York City who was free that day, and she came. She had modeled for me before, so that worked out really well. TTN: What are you currently working on? DG: Right now, I am finishing up photos for Elley Gene clothing and accessories. After that I’ll be open for booking more shoots. TTN: What do the Elley Gene clothing and accessories photos consist of? DG: They are her summer clothing line and hair accessories. She is a very good, very friendly designer. Her stuff is awesome; I would wear it. This is my first time working with her. She had found me over https://modelmayhem.com. It’s a website for models, photographers, makeup artists and set designers. Basically, you could just plan a whole shoot on it. You could plug in what you’re looking for like a makeup artist for a shoot, plan it and get everyone together that way. It’s really helpful. When I got to Philly that’s how I found a lot of my models. TTN: Is there any sort of aesthetic you prefer? DG: Mostly high fashion. Even though it’s high fashion, it always has a lot of romanticism and fantasy behind it. That’s what inspires me. There’s always a little bit of that in my work. TTN: What is it about those themes that you like? DG: I feel like it’s easier if you look at a photo, and there’s a story behind it. It’s just easier to me if you go with those themes and people look at the photos and see there is a story behind it. TTN: What would your dream photo shoot consist of? DG: It would be with Lara Jade, the girl who inspired me to even get a camera. She is world-known now, but anything with her would just be a blast. TTN: What about Jade inspires you? DG: Her work was the first to actually hit me. It was just so beautiful. It was the first work that I saw that [had] a concept or a story behind it, and that’s why I liked it so much. And the fact that she started off around 15 or 16, as well. To be honest, she wasn’t even that good and to watch her grow into what she is today is even more inspiring because not everyone starts off amazing at what they do. Assistant professor of mathematics Dr. Benjamin Seibold juggles studying mathematics, traveling the world, teaching differential equations, creating sculptures and playing ultimate Frisbee. And, to top it all off, he recently completed research on traffic jams.